I’ve had buffalo sauce on my to-make list for a long time. I mean, clearly, buffalo wings look amazing so I had to try it. But the thing is, apparently Frank’s RedHot sauce is the one and only hot sauce you should use to make buffalo sauce. That’s what people from Buffalo, NY, USA say anyway. And it wasn’t available in Australia. Bummer. So I had completely forgotten about this little project of mine until one day, Solal comes back from our local Montreal store and proudly shows me a bottle and says: “Look I’ve found a new hot sauce to try!”. Naturally. Solal + hot sauce? Best friends. I mean… he snacks on hot peppers. It’s his thing. Anyway, this new hot sauce was…Frank’s Red Hot sauce! Coincidence? I don’t think so. It was just a supernatural reminder to finally make a buffalo something. Whoever’s out there, I heard your message loud and clear! 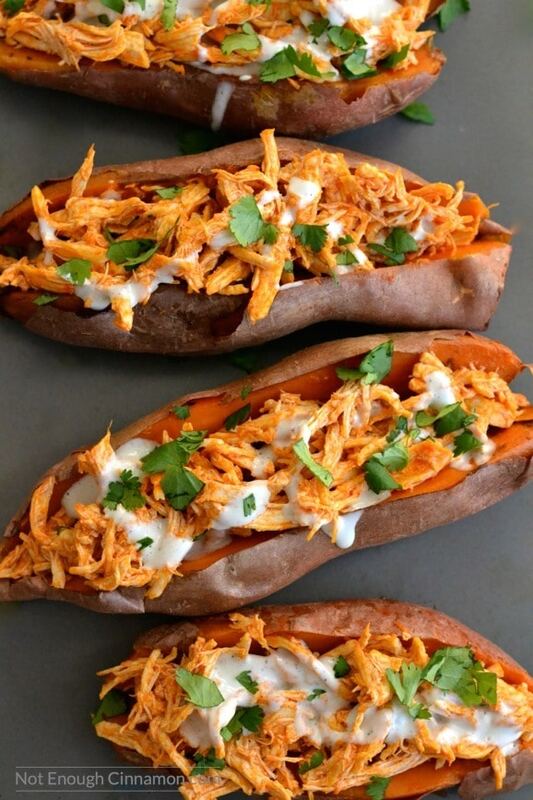 Baked Sweet Potatoes + Buffalo Shredded Chicken + Blue Cheese Sauce = Foodie Heaven! I didn’t think the internet needed yet another recipe for buffalo wings so I set my heart on something a little bit different and, may I say it, a little bit healthier. Baked sweet potatoes, with a crispy skin and soft flesh, stuffed with shredded buffalo chicken. As a finishing touch, I added a drizzle of my skinny blue cheese sauce. O.M.G! Seriously. 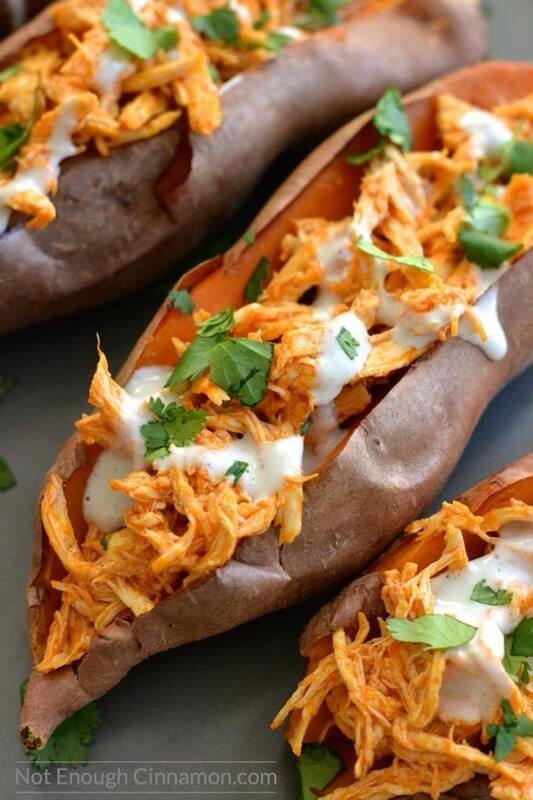 These Buffalo Shredded Chicken Stuffed Sweet Potatoes are comfort food at its best. And you would think it has about 1 million calories per serving, right? Newsflash: One of these stuffed sweet potatoes is only 320 calories! No, I’m not kidding. And it’s not even a tiny portion. It’s massive! 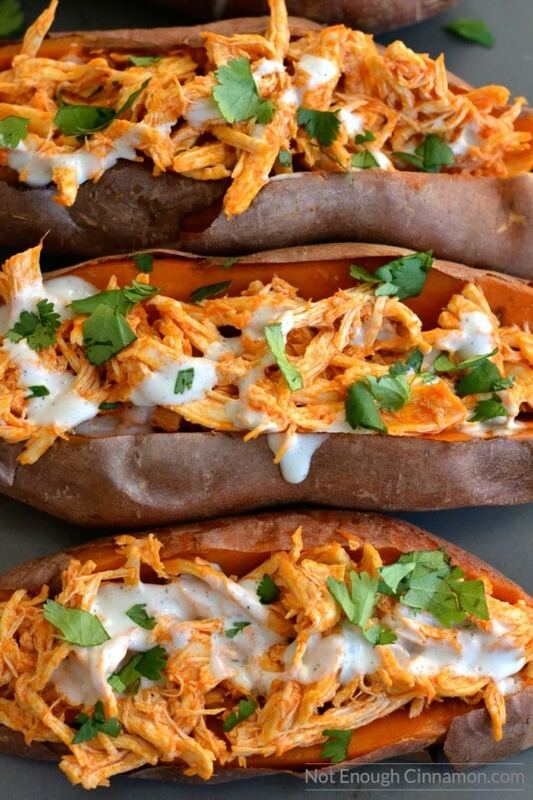 If you tried these Buffalo Shredded Chicken Stuffed Sweet Potatoes, don’t forget to rate the recipe below and let me know how it went in the comments – I love hearing from you! You can also follow me on Instagram, Pinterest, and Facebook for more deliciousness and behind-the-scenes! 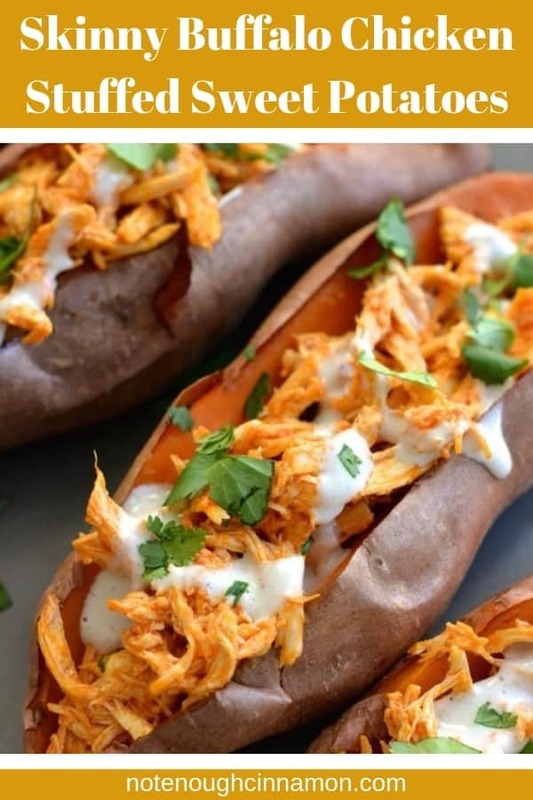 These skinny buffalo shredded chicken stuffed sweet potatoes drizzled with light blue cheese sauce are not only extra delicious, but they're also very easy to make, healthy and less than 320 calories per serving! Preheat oven to 400F/200C. 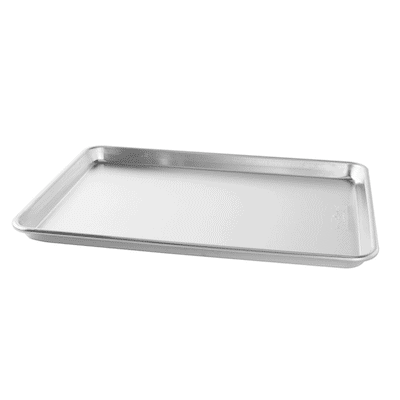 Line a large baking sheet with aluminum foil, place sweet potatoes on it and bake for 30 minutes or until flesh is very tender (test with a knife). Turn off the oven and keep the sweet potatoes inside to keep them warm. In another large pot (you can use the same one you used for the chicken) over medium heat, combine hot sauce, vinegar, Worcestershire sauce, garlic powder. Add butter and whisk while it's melting. When butter is incorporated, stir in cornstarch dissolved in 1 tbsp water. Whisk until sauce thickens, about 30 seconds. Turn off the heat and add shredded chicken. Mix thoroughly to cover chicken with sauce. Take the sweet potatoes out of the oven, cut them in half lengthwise (without cutting them all the way down so that the two parts stay attached together) and stuff them with shredded buffalo chicken. Drizzle one tablespoon of blue cheese sauce on each sweet potato. 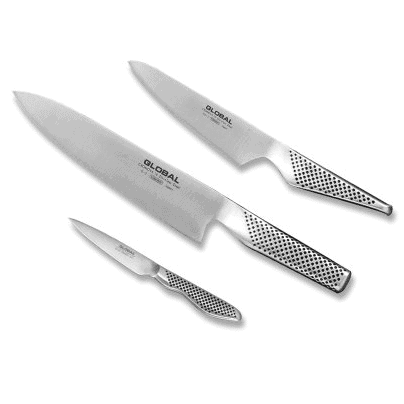 Top with fresh herbs if using. Serve immediately. It looks so delicious! Wonderful combination of flavors! Thank you Nagi, can’t get enough of them! These are SO good! For sure a must and will be a staple at our house! Yay so happy to read that Kara! These were AMAZING! I am addicted. Hands down one of the best recipes I’ve ever made! Thanks for posting! You’ve just made my day Kirsten, thank you!! 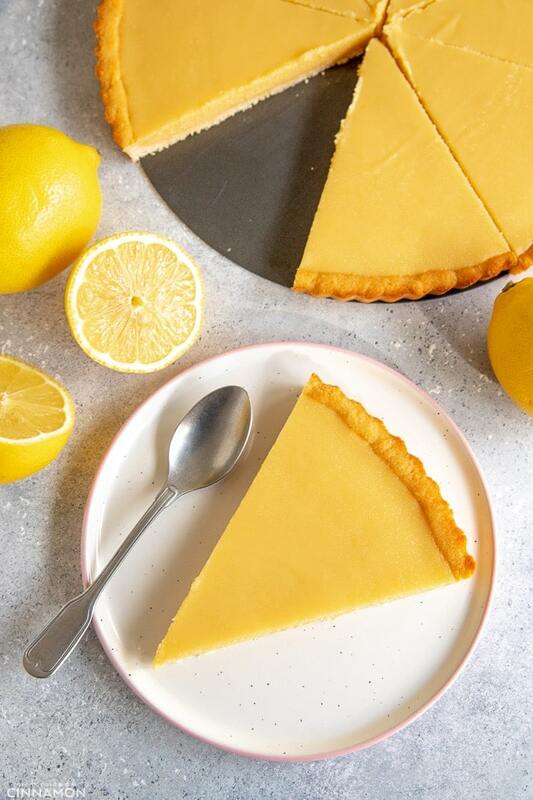 This recipe looks declicious, however, I see you have it tagged as gluten free and I just want anyone like myself that has celiac to know it is not – wortshire sauce has malt vinegar in it which is not gluten free! Just want everyone out there who suffer from the horrible celiac disease who are knew to it to be aware! Thanks so much for letting us know, I had no idea! What do you usually use as a substitute? The Wizard’s Sauces, Organic Gluten-Free Vegan Worcestershire Sauce ( This is very good) Worcestershire sauce . Any suggestions on what I can use instead of butter? Sounds delicious! Hubby and I both have Celiac and I’ll be making this tonight. Looks amazing. Just wanted to share that Lee & Perrins worchestire sauce is Gluten Free. These were great! The buffalo chicken was perfect. I was eating it out of the pan! I just have a question about the portion size, I want to make this for just 2 people. Do you think approximately adjusting the portions will work? Do you think you could make the chicken in the sauce in the crockpot? I took a risk tonight and made these for me and my husband. I knew I’d love them, but my husband wasn’t sure if he liked sweet potatoes or not. They ended up being a big hit! One thing- it took my sweet potatoes an hour to cook. Wasn’t expecting that, but now I know. So glad to hear it was a hit! Yes it definitely depends on the oven. I made them again last week with a different oven and it took about 40 minutes so it’s best to always check before taking them out of the oven. This was wonderful! Definitely spicy, but good spicy :)!! I was so excited to taste these flavors together and I loved it! “good spicy” haha I know exactly what you mean Caroline! 🙂 Glad you liked the recipe! Did you poke sweet potatoes before putting them in oven? Put olive oil on them? Anything? This looks soo good! But my kiddos don’t like spicy at all! Is there a substitute for the hot sauce? That’s a tough question! I would use 1/3 cup tomato sauce and 1/3 cup Frank’s but the taste will be different and I can’t guaranty I won’t be spicy at all. It should be pretty mild though. The other option is to add more butter to dilute the strength of the hot sauce but you’d be upping the fat and calories content, if that matters to you. Just tried this recipie and it was amazing! My fiancé said its his favourite thing I’ve cooked to date and I’d probably agree! Yum! The nutrition fact is for one Serving? Thanks! Just made that for dinner and it’s delicious! There’s a print button in the recipe box Kate. I did coconut oil instead of unsalted butter and they were AMAZING. Thank you for the amazing recipe! Hello from Buffalo, NY! 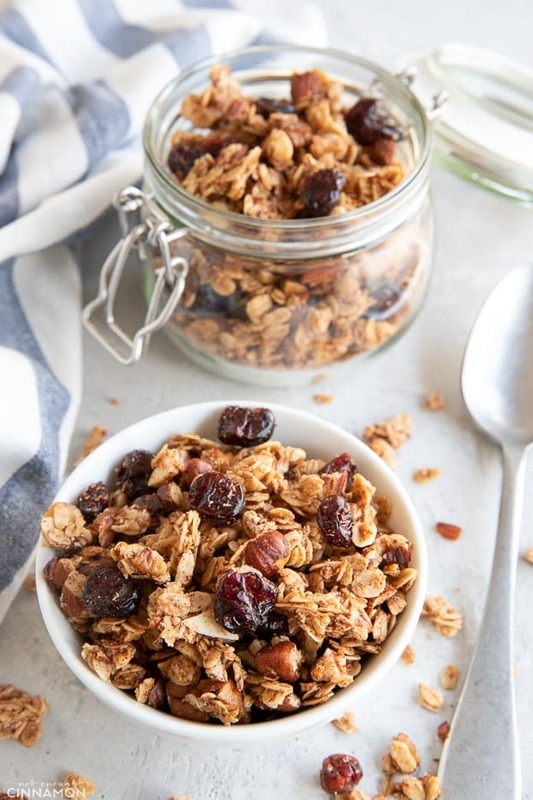 I just pinned your recipe and it sounds so yummy I can’t wait to try it! You’re so right we only use Frank’s to make our chicken wings???? When I make these next week I’m going to try the sauce with just the Frank’s and the butter..that’s how we make our sauce for the wings..can’t wait to try them! I just made this recipe for lunch…. It was AMAZING! So flavorful and filling.. I will definetly be having this again very soon!! Thanks for this amazing healthy recipe!! Making a little happy dance right now 🙂 So glad to hear you loved it Natasha! Quick question, wouldn’t you need to scoop out some of the sweet potato to make room for the chicken filling? I currently have this in a crock pot and am so excited for dinner! I also threw some cream cheese in…not so “skinny” I know. ??? ?I’m going to cut and roast the sweet potatoes instead of stuffing them. For those weary of Worcestershire sauce you can use coconut Aminos in place. Sorry to hear that Megan! I personally LOVE the combo (and I know a lot of people do) but we all have different tastes 🙂 I hope you still enjoyed them separately! I am finding a LOT of recipes that have nutritional info posted on them online are not matching up with I plug them into a counter for myself. I am beginning to get frustrated..a few calories difference is fine but 100 plus can ruin someones day who is trying to stay on track. Sounds yummy though and even at my corrected calories count is worth a try. I agree. I’ve imported the recipe into MyFitnessPal, and even used only 1.25 lbs of chicken (you call for over 2 lbs), only five 5″ long sw. potatoes… and the recipe comes in at 550 calories per serving. Other than that- this REALLY is a FAVE lunch staple of mine. I had to scale mine back too. I eliminated the Blue Cheese Dressing and lowered the butter to 1.5 T instead of 4. Cal/336/F4/Carb 46/P30. Everything else is the same. I didn’t get the hot sauce, can you recommend another hot sauce? Do you mean another brand of hot sauce? I’ve always used Frank’s so I’m not sure, sorry! I made this for my family’s super bowl dinner and it was a hit! So delicious!! Yay so happy to hear that Amber!! Made these and they were delicious! Thanks Lisa, so glad to hear! Can I use a toaster oven to bake the sweet potato?! I think it should work, yes! As long as they’re tender inside and a bit crispy outside, you’re good to go! Awesome recipe and looks really great for guests! Been asked to share the recipe lots of times now. Thank you!! Hi, I am planning to make the chicken for me and kids. My husband however is vegetarian, do you think mushroom can be substituted (will not be cooked in water, but roasted in oven), or do you have another suggestion for chicken substitute? Hi Wan, I think thick mushrooms would be a great substitute! Make sure they’re still firm and not too tender, I think it would taste better. Amazing! Just made it for dinner… so delish! Hi! This looks wonderful! I look forward to trying it soon. I’m trying to pin it and I keep getting an error of ‘Sorry! This site doesn’t allow you to save Pins.’ no matter which method I use (including your share this post link). Is there a way to get around this or do you truly not want us to pin stuff (though it looks like there is a nice photo layout created specifically for a pin already?). Thanks in advance and thanks again for your recipe! Can I freeze these in freezer safe container and microwave when ready to eat? I’d love to incorporate this meal in my meal prep. I’m thinking I can just add the dressing and parsley after microwaving..
Hello Trista! 🙂 So glad to hear you both loved this recipe! And yes, don’t you love how filling it is?! In the process of making them as we speak!! The chicken and Buffalo sauce is absolutelty delicious! I’m gonna save the sauce recipe and use it for chicken salads even! I did want to mention however I cooked the sweet potatoes as mentioned and they aren’t nearly done! Thank you Sarah! Yeah sorry about the sweet potatoes, you’re not the first one to mention that, I think my oven of the time was really strong and the temperatures not completely accurate. These are a staple in our fam. Sooooo good! Pretty healthy dinner and my fam loves them! I make the blue cheese dressing too. I’m trying it with creme fresh this time, instead of Greek yogurt. I’m going to try this tonight but will eliminate the butter. After I put all the ingredients on MFP it was still 336 calories with 1.5 T of unsalted Butter. I am counting macro’s so I have to be pretty precise! But, I can’t wait to try it!! I tried it last night! I only used 1.5 T of butter. It was great!! It wasn’t too spicy for me! It was yummy!! I will have it again tonight! Yoohoo so glad to hear you loved it Suzanne! I love this dish but it always takes longer to cook the sweet pots…any tips or suggestions? A lot of people told me the same thing – I think my oven of the time was very hot and probably not accurate with the temperature. What you could do to speed up the process is to pre-cook the sweet pots in the microwave if you have one (I’d say about 7-10 minutes on high) and finish them in the oven to get that “roasted in the oven” flavour. You could also cook them completely in the microwave, but it’s not as good as baked in the oven in my opinion. Awesome recipe. Easy and flavorful. Actually made chicken in a pressure cooker and shredded. Very moist.Frozen to shredded in 50 minutes. wow I’ve really gotta get my hands on a pressure cooker! Hi Marie, I’m in Brisbane so if you can’t get Franks’ Hot Sauce here in Oz, can you substitute for Sriracha or would this be a completely different taste? Hey Gail! I actually found some Franks at Coles when I came back to Australia a months after I wrote this! Yoohoo 🙂 They only sold it in small bottles though, so you’d have to buy two. Sriracha wouldn’t really work here. Hey Gail! I actually found some Franks at Coles when I came back in Australia a months after I wrote this! Yoohoo 🙂 They only sold it in small bottles though, so you’d have to buy two. Sriracha wouldn’t really work here. This recipe is delicious and my boyfriend loved it too. Super easy and healthy! Will make again soon. I made this a few weeks ago and my “set in his ways” husband was quite dubious but I made him try it. He loved it and so did I! So delicious and easy! We’ve been having it every week ever since. Leftovers for work the next day heat up beautifully. Thanks for a great recipe! Love it when it’s hubby-approved too 😉 Thanks for sharing Angela! Do you know what the recipe would be if I cut this down to 4 servings? It’s just my husband and I – we won’t eat 7 potatoes. Thank you! Did you serve these w a side dish (or vegetable) or side salad? Or just own their own? Want to make these for dinner this week and just planning it all out! can the remainder of these be frozen? I haven’t tried but I think it would work fine yes. I wouldn’t freeze the sauce and the herbs though. Otherwise, I know this keeps well for about 5 days in the fridge. Hope this helps! I would never have thought to combine buffalo chicken with a sweet potato but looking at it, it just works! What a filling dish! I might sound odd but it DOES work really well! 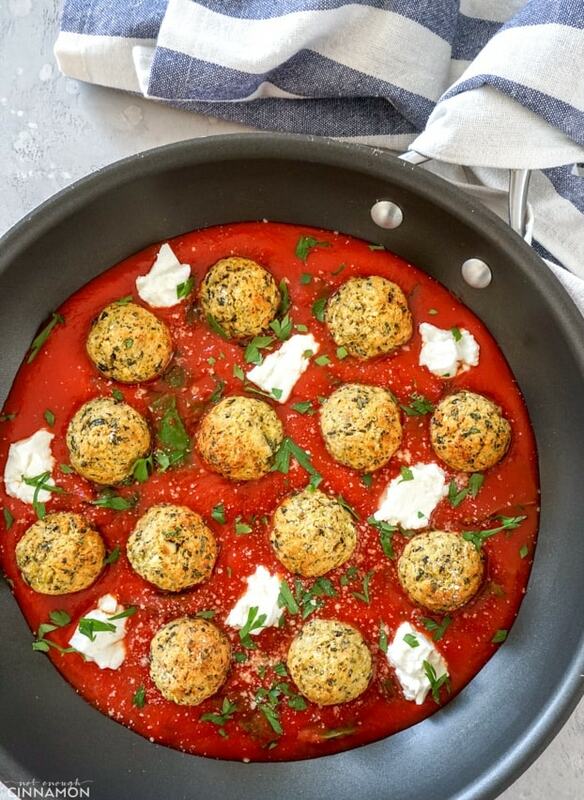 I made this recipe again this week and I still love it SO MUCH! wow how did I miss this one? for two years I could have been making this! What a genius idea! thanks!! Looks so delicious, and I love the lighter version. All of these flavors together are so mouth-watering! 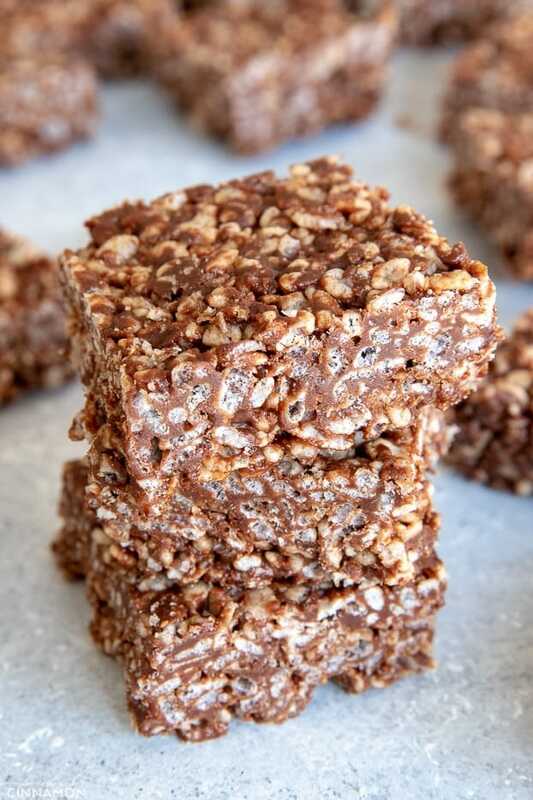 I realize I’m late to the party, but I just found this recipe and tried it today – OMG, sooo good!! I had some bacon left over that I crumbled over the top (because, bacon) & it was legitimately amazing! This is a new staple in our house!! So good! Hi! Do you know what I can substitute for corn starch? Flour? Thanks! You can use arrowroot instead! It should work with flour too but I’ve never tried so I can’t be positive. Hope this helps Jen! Just curious on how long the buffalo sauce would last in the fridge? I’m thinking about 4 to 5 days at least – but I’m not sure because I’ve never stored it separately. These are soooo good. The only thing however is the potatoes took way longer than 30 minutes to cook. I make these all the time now because they’re so delicious but I pierce the potatoes with a fork first to cut down baking time. I also make shredded chicken in the crockpot to save time. Thanks for the recipe!! These are SO GOOD. I have an anova precision cooker, so I cooked the chicken sous vide. I also just microwaved the sweet potato because I’m lazy and didn’t want to use the oven and wait! Haha. Turned out perfectly. I also made your skinny blue cheese dressing recipe which is amazing! I made a ton of it so I will he saving it for later use! Possibly one of the best recipes I’ve tried in a long time. 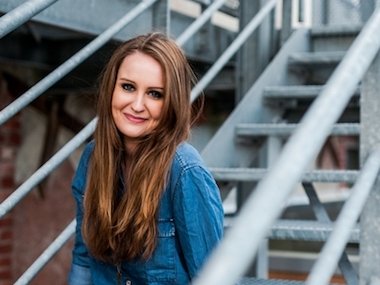 You made my day Chasity – thank you! !